DMS (degrees, minutes, seconds) : N 39° 35' 40" W 75° 7' 15"
188 US-40, Elmer, NJ for directions to CCBTNJ. This works for Google Maps & some models of GPS. 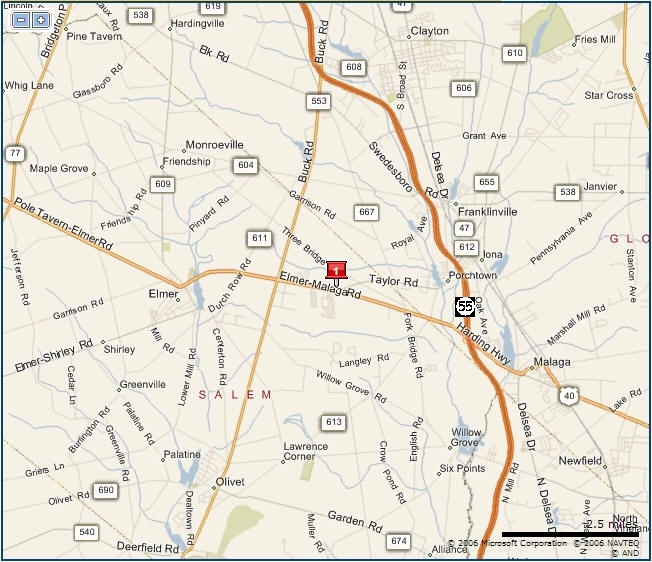 CCBT is located in Salem County, NJ approx. 1 Mile EAST of Buck Road (CR-553) & approx. to Buck Road (CR 553) & Taylor Road. From the North: Take New Jersey Route 55 South to Exit 39 B (US-40), bear right onto Rt. 40 West. From the exit go approximately 2.5 Miles, the church is on the right, across from Harding Woods Mobile Home Park. From the South: Take New Jersey Route 55 North to exit 39 B (US-40), bear right onto Rt. 40 West. From Exit go approximately 2.5 Miles. The church is on the right, across from Harding Woods Mobile Home Park. CCBTNJ is on the left across from Harding Woods Mobile Home Park. and 1 Mile EAST of Buck Road (CR-553). The church is on the left across from Harding Woods Mobile Home Park. From the East: Take Rt. US-40 West – cross over NJ Route 55 go approx. 2.5 Miles. The church is on the right, across from Harding Woods Mobile Home Park.